Salt is used in the preservation and flavoring of food and has become a huge part of American food culture. Studies come out every day telling people to reduce intake and some even saying that too little intake is bad. With the majority encouraging reduction food procedures are scrambling to expand their R&D efforts to create new products. Researchers can be aided by the federal and state R&D tax credit. Nine out of ten Americans consume too much sodium, most of it being in their food before it gets to the table. 65% of sodium intake comes from convenience stores, 25% comes from restaurants and 10% comes from other stores. Products are measured by sodium but to find out how much salt is in them you must multiply the milligrams by 2.5. Sodium aids in the regulation of fluid in the body and aids in the uptake of various other nutrients into cells. Additionally, salt contributes to digestion by assisting in the creation of acidic stomach fluid. Sodium is hidden in most foods as a preservative and flavor additive. Excess sodium consumption was attributed to 2.3 million deaths worldwide in 2010. Excess sodium consumption can lead to high blood pressure, stroke, heart failure, osteoporosis, stomach cancer, kidney disease, kidney stones, enlarged heart muscle, osteoporosis and headaches. 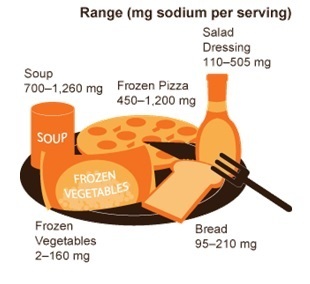 Figure 1 depicts average sodium per serving for typical food items. In the Intersalt trials, sodium excretions were measured to determine the impact sodium intake has on an international population. In these trials researchers concluded that the world's average salt intake was about 4000 milligrams. There were huge discrepancies between different countries' average intake, ranging from 200 mg per day to 10,300 mg per day. Countries with the highest numbers had significantly higher blood pressures while countries with lower numbers had little or no upward trends of blood pressure with age. Two trials of hypertension prevention were conducted after Intersalt in the late 1980s and early 1990s. Lifestyle changes such as weight loss, stress management, nutritional supplements and consuming less sodium were measured. In both studies a small decrease in blood pressure was seen with sodium reduction over the 18 to 36 month trial period. Years after the trial, researchers surveyed the participants and found that after 10-15 years, decreases in sodium intake were linked to a 25 % decrease in the likelihood of having a heart attack of stroke. Additionally those who were consuming potassium in a more consistent ratio to sodium had lower chances of developing cardiovascular trouble. The DASH trial studied a dietary approach to prevent high blood pressure in 1994. 459 participants were randomly assigned to either a standard American diet in red meat and sugars that were low in fiber while the rest were assigned a similar diet that was richer in fruits and vegetables. The second diet is known as the DASH diet with emphasized fruits, vegetables and low fat dairy foods with and limited red meat, fats and sweets. 8 weeks after being on the diet both groups had reduced blood pressure but the DASH diet produced a stronger effect on blood pressure. This study further concluded that lowering sodium intake in either of the diets helped in reducing blood pressure. A study published in the American Journal of Hypertension suggests not reduce your salt intake just yet. The analysis coming from Denmark finds that current recommended salt guidelines may be too low. In contradiction with many studies the new research found that Americans consume a healthy amount of salt although it exceeds recommendations from the U.S centers for Disease Control and Prevention. In this study researchers estimate the safest range of sodium intake to be between 2,645 and 4,945. When salt intake was under 2645 mg deaths increased so therefore salt intake can be dangerous at both high and low levels. There are many uses for salt in the food industry resulting in much of the sodium you consume already being in your food before even getting it. With the FDA proposing new guidelines as of 2014, companies are challenged to find a replacement to sodium. Many experts have said that while the guidelines are definitely a good starting point in increasing public awareness, they will not put enough pressure on eateries to limit their use of salt. Lisa Young, an adjunct professor of nutrition at New York University has said that "If one company doesn't lower it, then another one wont" but "if its mandatory and everyone starts lowering sodium then we're in good shape." Additionally, a Harvard professor Fred Sacks said "restaurants and food companies would have to confront the issue sooner or later." Sacks went as far to say "It just appalls me how much salt the chefs will just pour on the food, it's sort of a lazy way of flavoring food. The food industry will eventually be pushed to respond." The federal government has issued new guidelines for schools to lower sodium content and raise the amount of whole grains that are served in school lunches. Since the emergence of refrigeration and other methods of food preservation the actual need for salt as a preservative has decreased. With the exception of cured foods, smoked foods and most pickled products, salt actually isn't necessary for safe processing of home canned or frozen fruits and vegetables. A switch in diet from smoked and cured meats to more earthy foods such as fruits in vegetables is definitely a starting point for sodium reduction. Additionally these foods are high in potassium which help to reverse the adverse effects of high sodium intake. Regulating sodium intake is essential to a healthy diet. According to research there are a few easy ways to do this. First off cooking from scratch is very important because many food companies hide sodium within their frozen products. If you are going to eat packaged foods choosing products that are sodium free, or at the very least low in sodium, is essential. Foodtech Canada published a report establishing a plan for how to reduce sodium intake. First, gradual sodium targets based on food categories must be established and monitored through the years. Next, an efficient system for monitoring the sodium intake in the diet of the population must be established. Lastly, education and incentives must be established in the food industry. Besides the regulation of diet, salt alternatives can help with drastically decreasing salt intake. In a Consumer Report's study a blind taste test was performed in which scrambled eggs were prepared with salt and two other dishes were prepared with salt substitutes containing potassium chloride. The taste testers were not impressed. Consumer Reports concluded that to cut sodium and not sacrifice taste, herbs and spices were better alternatives as opposed to "fake" salt . Seaweed granules are emerging as an alternative to salt due to its ideal balance of all mineral salts. Seaweed granules are about 3.5 % sodium as opposed to salt which is 40 % sodium. Another replacement for sodium is molasses. When recipes call for soy sauce or teriyaki sauce molasses can be a low sodium replacement that does not compromise taste. Additionally recipes that call for chicken broth can be replaced by a mushroom broth. Instead of opening the can, boiling mushrooms for about a half hour provides a broth that is full of natural umami flavor and is very low in sodium. Another great substitution is nutritional yeast; it can be put on popcorn, thanksgiving dinner or even pizza dough for a zesty kick. Nutritional yeast contains 0 mg of sodium. According to research performed at Sheffield Hallam University seaweed can be used as a natural alternative to salt in processed food. Besides reducing salt, seaweed has other benefits such as playing a beneficial role in common health conditions like, obesity, diabetes, thyroid problems, breast cancer and cardiovascular disease. The research performed found that seaweed granules reduce the number of micro organisms and additionally lengthens the shelf life in a similar way to salt. Furthermore when the purity of the seaweed was tested in terms of microbial load and external pollutants it was concluded to be extremely clean. A University of Niigata study, performed in Japan, was released on July 23rd, 2014 and built off of some common knowledge. High levels of sodium lead to several health complications and a good way to cut down intake is by reducing junk food consumption. Smoked bacon, fries, hot dogs and chicken strips are known to contain hidden high salt levels. Researchers found that people eating around 5.9 grams of sodium everyday were twice as likely to develop cardiovascular disease then those consuming 2.8 grams a day. Furthermore the study found that reducing sodium intake can prevent dangerous complications with diabetes. Concluding the study it was stated that the effects of a high sodium diet are aggravated by poor blood sugar control. Sodium excretion is a direct measure of sodium intake because the more you intake the more you excrete. Sodium excretion of over 6 mg is linked to increase in all types of cardiovascular disease. More surprisingly sodium excretion under 3 mg is linked to increased chances of cardiovascular death and hospitalization for congestive heart failure. This research proves that not only excess sodium intake can have adverse affects but too little intake can also have adverse effects. A recent study found that sodium intake in animals is controlled by networks in the brain and not by the salt in one's food. 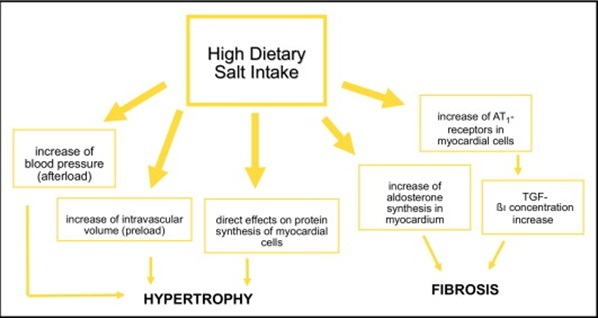 The data demonstrates the possibility that human sodium intake is regulated within a relatively narrow normal range that is defined by the body's physiology and biological needs rather than by the food supply. The range is approximately 2600 to 4800 mg and should influence the policy of sodium intake. The point of the study was to prove that the current U.S. sodium guidelines for healthy individual, which is no more than 2300 mg per day, was unsupported by data in the medical literature. The Center for Science in the Public Interest is urging fast food companies to lower sodium in all of their food and is praising some fast food chains for listening. It is estimated that 100,000 lives could be saved a year if America's sodium intake is cut in half and furthermore that sodium intake is the single biggest problem in the American diet. Subway estimates that they have reduced sodium by 35% in their Fresh Fit sandwiches and 30% across its entire sandwich menu in the past four years. They were able to achieve this drastic cut in sodium by cutting sodium in their bread and deli meats according to Lanette Kovachi, a global dietitian for Subway. In the 4th quarter of 2013 Boston Market began an initiative to cut the sodium in their products, cutting the mashing potatoes by 30%, chicken by 20% and cornbread by 30%. As a strategy for marketing they did not advertise the sodium reduction until February of 2014 due to the fact that some may not be interested in a change of flavor. Once the new formula was widely accepted it became a selling point. This is a potential business model for future companies reducing sodium. Sodium intake is as essential to life as water intake is. In moderation it is good for you but too little or too much can prove to be deadly. The perfect amount of sodium is still up for debate providing ground for future research and development of new sodium intake processes.